More than a thousand SugarCRM Customers and Partners gathered at SugarCon 2017 in San Francisco last week. 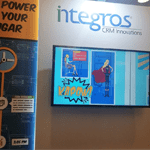 Integros participated in the annual global event as a Silver Sponsor and showcased Logic Builder and TimeLine Viewer – two innovative Sugar CRM tools which received excellent feedback from the attendees. Logic Builder is a tool that increases User Adoption by making SugarCRM more convenient and efficient as it allows users to bring all their SugarCRM automation ideas to life using visual programming. It also helps to make SugarCRM AI-ready due to its powerful data processing capabilities. TimeLine Viewer saves time on sifting through modules, reports, records and subpanels with the possibility to track key business events via special TimeLine Views, as well as to flexibly adjust them to your unique style and needs. We would like to thank all the participants. This incredible event was a great experience for us. We hope to see you all next years at SugarCon!